With our 2nd birthday party just days away, we at PMHQ are looking for the perfect outfit that is both fun AND festive! What says va-va-vivacious than black lace? Just add a few holiday trends like a metallic gold shoe and darling bow tie accessories to get seasonably stylish. Cozy up with a cream peacoat, and you’re ready for a December birthday to remember. 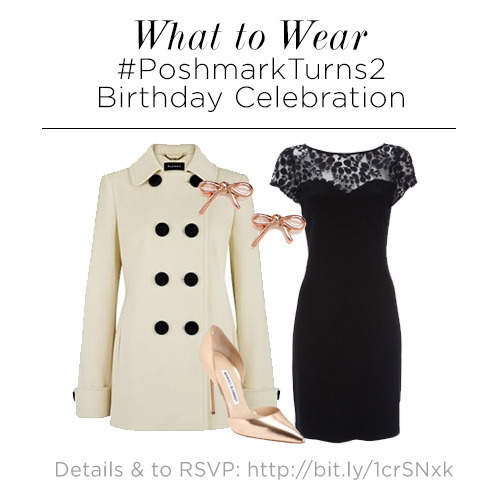 If you’re looking for a birthday bash to wear this sensational outfit, be sure to RSVP to our #PoshmarkTurns2 birthday celebration happening nationwide on Friday, December 6th. For all our San Francisco bay area Poshers, Team Poshmark is throwing an extra special birthday bash at PMHQ, so don’t miss out! For more details and to RSVP, check out our blog post! Next Post Show Your POSHLOVE by Voting Poshmark!